Singled out as a ‘great entertainer’ by Celine Dion, Brown delivers spot on impressions of such notable celebrities and artists as Garth Brooks, Robert DeNiro, Elvis, Michael Jackson, Jack Nicholson and many more. Gordie Brown combines the best of Las Vegas entertainment into one nonstop high energy show. With comedy, singing and talent beyond compare, Brown’s return to the Strip in an intimate venue is a must see. 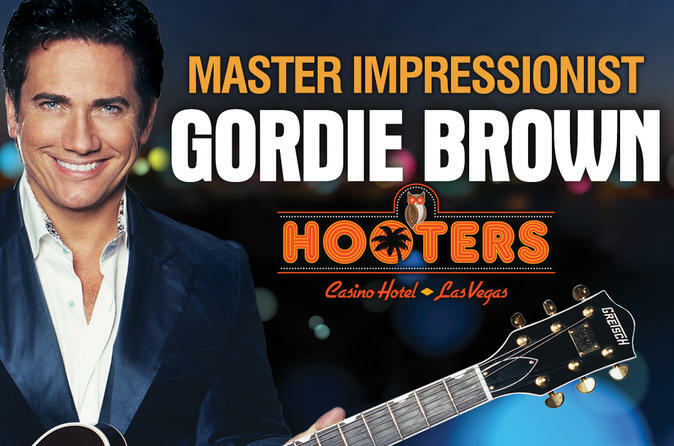 Make your way to the Hooters Casino Hotel on the Las Vegas Strip to see Gordie Brown’s show. Watch as this entertainer sings, tells jokes, and does impersonations of famous celebrities, such as Elvis and Jack Nicholson. Starting out as an opening act for greats such as Paul Anka and Barry Manilow, Gordie definitely made a household name for himself performing all over Las Vegas including the Golden Nugget and Planet Hollywood. Gordie Brown has been credited as the best impressionist even getting praise from Celine Dion! Choose between two seating sections, and sit back and relax as you enjoy one of the Las Vegas entertainers have singled out for his skills.